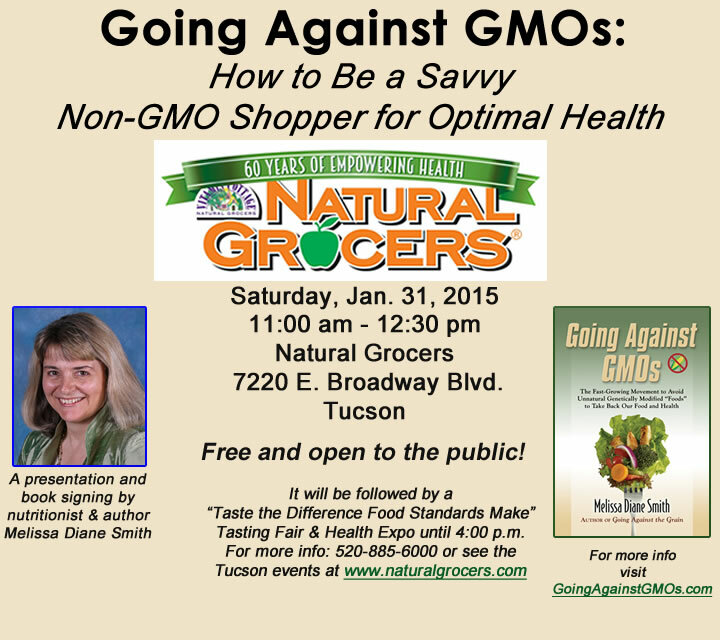 I’m delighted to be speaking and signing copies of my new book, Going Against GMOs: The Fast-Growing Movement to Avoid Unnatural Genetically Modified “Foods” to Take Back Our Food and Health, at the new Natural Grocers natural foods supermarket, 7220 E. Broadway Blvd., in Tucson this Saturday from 11:00 a.m. to 12:30 p.m.
On Thursday, January 29, 2015, at Noon Eastern time (9 a.m. Pacific), be sure to tune into an interview with me, Melissa Diane Smith, about Going Against GMOs on the Family Food Kitchen radio program on RadioMD: http://www.radiomd.com/show/family-food-kitchen. The program with hosts Ellen Briggs and Carolina Jantac, M.S., R.D., has the tagline, “Inspiring families to be healthy with every bite.” I’m in total alignment with that tagline and I’m thrilled to be a guest on the program. In the interview I’ll be doing with them, I’ll quickly fill parents and families in on what they need to know about genetically modified foods and provide practical advice on how to go against them as a family when shopping, cooking, and eating. 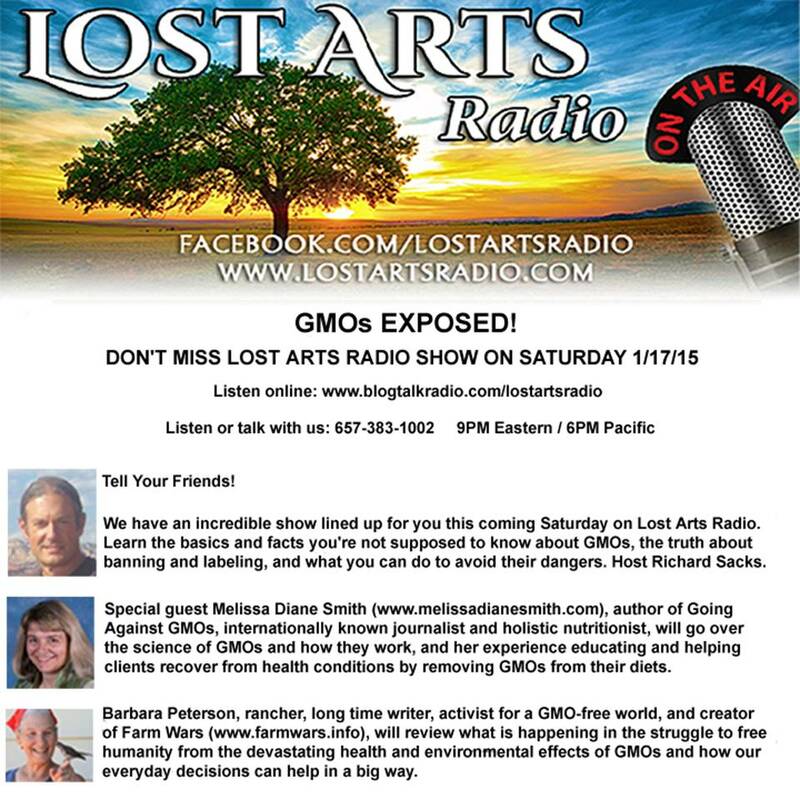 Lost Arts Radio Program on GMOs & What We Can Do About Them this Sat. On Saturday, January 17, 2015, starting at 9 p.m. Eastern time (6 p.m. Pacific), don’t miss the Lost Arts Radio program, which will have a special “GMOs Exposed!” Internet radio show offering two unique perspectives on the problems with genetically modified foods and what we can do about them. Host Richard Sacks will interview me, Melissa Diane Smith, about my new book Going Against GMOs from 7:00-8:00 p.m. Mountain time, then rancher Barbara Peterson, creator of Farm Wars (www.farmwars.info), from 8:00-9:00 p.m. Mountain time. Listen to the show live at this link: www.blogtalkradio.com/lostartsradio. Or if you miss the show, go to that same link and hear the archive of it.